Want Genie garage door opener installation in Brampton, Ontario? Need Liftmaster repair? Whenever there is a problem with your residential opener or you plan to install a new one, ask assistance at our Garage Door Repair in Brampton. We don’t make any compromises when it comes to your safety. Our company recommends the most suitable openers for your property, uses durable repair parts, responds as quickly as possible, and employs licensed technicians. We can fix, maintain and install garage door opener systems by any large brand in Ontario and do the job with respect to your safety. Every single technician at our local company in Brampton is certified to provide garage door opener installation. Whether you choose a new Marantec opener or one of the products from Sears, we can install your new operator. We have great experience in overhead opener installation and are also updated with the fresh models by Chamberlain, Craftsman and the other titans in the garage opener industry. This ensures expert installation but also huge assistance prior to buying a new product. Need help finding the right opener for your home garage? Our staff is at your disposal. It’s not easy to select a new opener. With our help, you will choose an opener of the right horsepower and enough features to meet your needs. Garage door opener replacement and installation are both performed whenever it is convenient to our customer. The latest features of openers enhance security and safety. Our techs focus on these features and make sure all parts are well-connected. Once the new opener is fitted, we run some tests and make the last adjustments to ensure the door will travel all the way up and down with safety. That’s exactly what we also do when we maintain your opener system. Ensuring your safety by inspecting and servicing the opener thoroughly is a policy at our business. 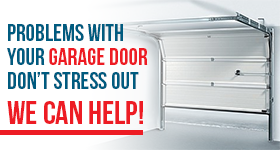 For the same reason, we also offer same day garage door opener repair. Whether we have installed your opener or not, you can turn to us if you have any problems. Want quotes or more information about our opener services? We are here to assist you. Call us.